I thought it would be quite interesting today to show you a view of either a speaker you own, if it happens to be an Axiom Product, or actually what goes into building a speaker box. Obviously most of the time we only see what’s going on on the outside of the speaker, not what’s inside. Let’s start with the sleeve of the speaker, which is actually one piece that comprises the front, back, and the sides of the speaker cabinet. This is actually CNC machined out of a single, solid complete piece of MDF. 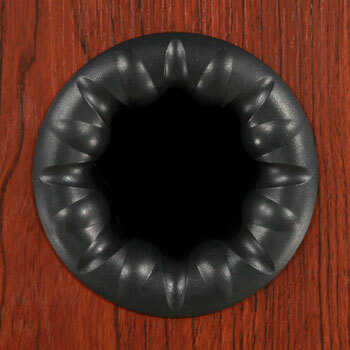 This is a piece of our standard finish Boston Cherry vinyl. If I flip this up you can see that the vinyl is already laminated onto the MDF (or Medium Density Fiberboard), which is the wood that provides the strength and the good acoustic properties we want. In this case the vinyl is actually providing the hinge to allow us to fold the front, back and sides together to make the cabinet. Then all we have to do is add the top and bottom pieces. You can see we’ve got a number of different components here. We’ve got ports, already mounted. There’s two on the back of an M80 and one on the front at the bottom. The crossover network which divides the frequencies between the different drive units – the tweeters, midranges and woofers – is mounted here. We’ve got braces, and in the M80 there are four window braces. Those braces are actually locked into these grooves called dados so that when the entire cabinet is glued together and the glue sets, it provides a very very rigid, very solid, vibration-free cabinet. Another interesting thing that’s inside any of our products that have a dedicated midrange are these black boxes: an independent sealed enclosure for each midrange. Because you don’t want the midranges interacting with the air pressure from the woofers inside of the cabinet, they have to be isolated. To do that, we have these plastic injection-molded chambers that are air-sealed to the cabinet. There’s a gasket that fits into a groove in the wood so that when the box actually meets up with this flat rib and it’s screwed down, now we have an air-tight seal. The box itself is quite interesting in its construction and is another example of the level of detail we go to at Axiom to get the best performance we can. More on that later. Essentially, once the box is mounted, glue is put in all of the grooves and all of the openings in the back of the cabinet, it’s folded around the top and bottom, and it’s clamped together until the glue dries. From a practical standpoint, if we tried to put bass signals into something like a tweeter, we’d burn it out instantly because it’s not designed to produce those low frequency sounds. Next are our Vortex Ports. Unlike many conventional ports that are simply circular in shape and are a complete cylinder on the inside, ours have these flared edges. One of the things that happens is that when you play your speakers at high levels with lots of low frequency information, there is a lot of air moving through the ports. And the air can actually create turbulence at high velocities, which will cause noises. We call it chuffing. And it sounds like what you normally hear when wind is rushing through a door that’s not closed properly. By putting these little fluted areas into the port itself, both the inside edge and the outside flare, we reduce the air turbulence and hence get a much quieter port. The other thing that happens is that we increase the effective surface area, or the cross-sectional area of that so that we have the ability to more tightly control the tuning frequencies. Next, let’s take a look at the backside of where the woofers mount in an M80. The brass-colored metal discs that you can see are T-nuts: metal-threaded inserts that mount from the backside with a little flange that keeps them secure against the inside edge of the front baffle. With a normal wood screw there is a risk: if you over-tighten it, it will spin and allow the screw to back off slightly, so you can actually get air leaks and other bad effects happening because now your woofer is not tightly tied to the cabinet. The T-nut allows us to put quite a bit more torque on the bolts that hold the driver in, which prevents that bolt from backing off in the future. These T-nuts are on all of the drive units from the tweeters, the midranges and the woofers. Let’s talk a little bit about this unassuming-looking piece of plastic which we call our midbox. Think of it as its own cabinet for the midrange drivers in products like our M60 Floorstanding Speaker and M80 Floorstanding Speaker. It’s a fairly complex and involved piece of tooling that was required to make this. Like any speaker cabinet, we don’t want any sort of vibrations. We want a very solid, very rigid enclosure for the midrange. Being plastic, if this was simply a straight-sided, straight-walled part, it would be very flexible. We designed the ridges to create strength in the part. So what we are doing is reducing the effects of any sort of vibrations that can be created from the frequencies that the midrange is reproducing. One of the other things that we’re concerned about is the back wave of the midrange interfering with the signal that’s coming from the cone of the midrange. We know that the sound comes off the front of the cone, of course, but sound also comes off the back of the cone. That sound – even with the damping material that’s inside the box – will reflect off of the interior surface. That’s why this surface has a convex shape to it. Between that and the ridges that are in the midbox, we can break up those reflections and smooth out the frequency response. One of the things that we pride ourselves in is that we do all of our plastic injection molding and tooling in-house. The core and the cavity are two pieces: one creating the shape of the outside of the part and one creating the inside. All of the tooling was done in-house and we’ll also mold this plastic part with our own molding machinery. We use something called ABS for molding parts in our 480-tonne press. I hope you enjoyed this look at some of the design and engineering that goes into the inside of an Axiom loudspeaker. Since 1980 Axiom has been designing, engineering and manufacturing award-winning home theaters and loudspeakers. Discover why our customers tell us they are "discovering their music all over again" and that they have "become the neighborhood's favorite place to watch movies". People who buy Axiom speakers are looking for the most exciting, realistic sound experience on the market, and Axiom delivers. Axiom's award-winning products are designed and built in Canada.